Yoga may aid in weight loss. If you want to lose weight, you know you have to get plenty of exercise. Pilates and yoga can help, provided you take other healthy lifestyle steps. When it comes to weight loss, both are fairly equal when it comes to calories burned. But you can't rely on yoga or Pilates alone for weight loss as neither is a huge calorie burner. Add some cardio to blast the fat faster, and ditch your old diet for one that is low in calories. The best way to lose weight is to burn more calories than you consume. Exercise and a low-calorie diet help you achieve weight loss. Anything that burns calories can help. Yes, that includes yoga and Pilates. However, you must balance your choice with a diet that helps you create a calorie deficit. To lose 1 pound in a week, you must eliminate 3,500 calories through diet changes and exercise. If you choose yoga or Pilates for weight loss, you must make sure you aren't eating too many calories, which cancels out your burn and gets in the way of healthy weight loss, and you definitely don't want that to happen. There are several types of yoga, each type burning a different amount of calories. The type you choose plays a big role in whether or not you'll lose weight by incorporating it into your routine. A 150-pound woman burns less than 200 calories in an hour with Hatha yoga, but may torch as many as 600 with Vinyasa yoga, according to the Health Status website. The type you choose affects how quickly you drop unwanted pounds in the studio, making it important to balance your favorite form of yoga with a diet that doesn't go overboard with calories. Pilates may appear similar to yoga, but the number of calories you burn makes it different. Yes, you'll still build strong muscles and burn calories, but if you want to lose weight, overestimating your calorie burn won't help you get there. A 150-pound woman new to Pilates who takes a one-hour beginner class burns only about 250 calories, but an advanced class burns about 400 calories, according to Health Status. Yes, you can still lose weight as long as you aren't eating more calories than you consume, but it might be difficult. You might lose weight doing yoga or Pilates, but you'll have more success if you combine your choice with a healthy and well-balanced diet. You can't hit the local burger joint after a yoga or Pilates class and still expect to drop unwanted pounds. Not only could you completely undo all your hard work, but you could take in many more calories than you just burned, totally hindering your weight loss goals. Instead, choose healthy foods from each of the food groups to keep your calorie intake under control and fuel your time on the mat. Fox News: Yoga vs. Pilates: What's Right For You? 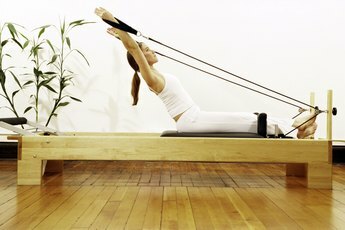 Are Private Pilates Classes Worth the Price? Can I Use Bikram Yoga to Maintain My Weight Without Dieting or Counting Calories?